McLaren has released the first official images of its P1 design study, the supercar precursor that we've all been waiting for. This stunner will officially debut at the Paris Motor Show next week. Calling the P1 McLaren's next "ultimate supercar," McLaren says this concept takes its inspiration from the company's rich racing heritage. Visually, we certainly see the connection with the late, great McLaren F1 – the concept seems to blend the proportions of the F1 with the overall design language of the current MP4-12C. With an exceedingly brief, snubbed nose flowing into wildly sculpted rear bodywork (we're especially fond of the rear three-quarter view), the P1 is more dramatic and compelling than it's relatively staid MP4-12C little brother, truly selling the supercar idea without having to move a wheel. That the concept is rendered in a searing shade of orange metallic doesn't hurt, either. Of course, McLaren isn't giving us any hints on the technical details for the eventual production version of the P1, though it does speak to the intent of the final car. 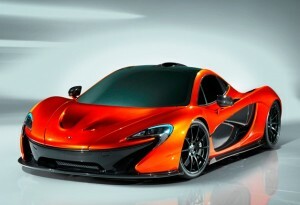 The P1 is not intended to be the world's fastest vehicle in terms of "absolute top speed," shooting, according to Ron Dennis, to be, "the quickest and most rewarding series production road car on a circuit." That's supercar snobbery – a cockiness based on purity of purpose, rather than numbers on a specification sheet – that is bound to resonate with car geeks everywhere.